This article is about the Geographic South Pole. For other uses, see South Pole (disambiguation). The Geographic South Pole is marked by the stake on the right. 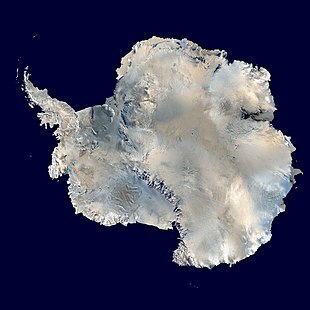 NASA image showing Antarctica and the South Pole in 2005. The South Pole, also known as the Geographic South Pole or Terrestrial South Pole, is one of the two points where Earth's axis of rotation intersects its surface. It is the southernmost point on the surface of Earth and lies on the opposite side of Earth from the North Pole. Situated on the continent of Antarctica, it is the site of the United States Amundsen–Scott South Pole Station, which was established in 1956 and has been permanently staffed since that year. The Geographic South Pole is distinct from the South Magnetic Pole, the position of which is defined based on Earth's magnetic field. The South Pole is at the center of the Southern Hemisphere. The Ceremonial South Pole in 1998. 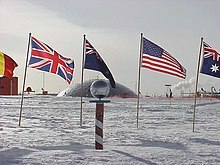 The Ceremonial South Pole as of February 2008. For most purposes, the Geographic South Pole is defined as the southern point of the two points where Earth's axis of rotation intersects its surface (the other being the Geographic North Pole). However, Earth's axis of rotation is actually subject to very small "wobbles" (polar motion), so this definition is not adequate for very precise work. The geographic coordinates of the South Pole are usually given simply as 90°S, since its longitude is geometrically undefined and irrelevant. When a longitude is desired, it may be given as 0°. At the South Pole, all directions face north. For this reason, directions at the Pole are given relative to "grid north", which points northwards along the prime meridian. Along tight latitude circles, clockwise is east, and counterclockwise is west, opposite to the North Pole. The Geographic South Pole is located on the continent of Antarctica (although this has not been the case for all of Earth's history because of continental drift). It sits atop a featureless, barren, windswept and icy plateau at an altitude of 2,835 metres (9,301 ft) above sea level, and is located about 1,300 km (800 mi) from the nearest open sea at Bay of Whales. The ice is estimated to be about 2,700 metres (9,000 ft) thick at the Pole, so the land surface under the ice sheet is actually near sea level. The polar ice sheet is moving at a rate of roughly 10 metres per year in a direction between 37° and 40° west of grid north, down towards the Weddell Sea. Therefore, the position of the station and other artificial features relative to the geographic pole gradually shift over time. 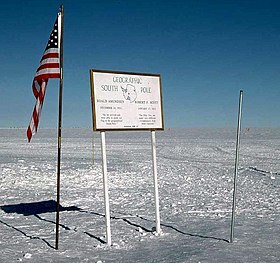 The Geographic South Pole is marked by a stake in the ice alongside a small sign; these are repositioned each year in a ceremony on New Year's Day to compensate for the movement of the ice. 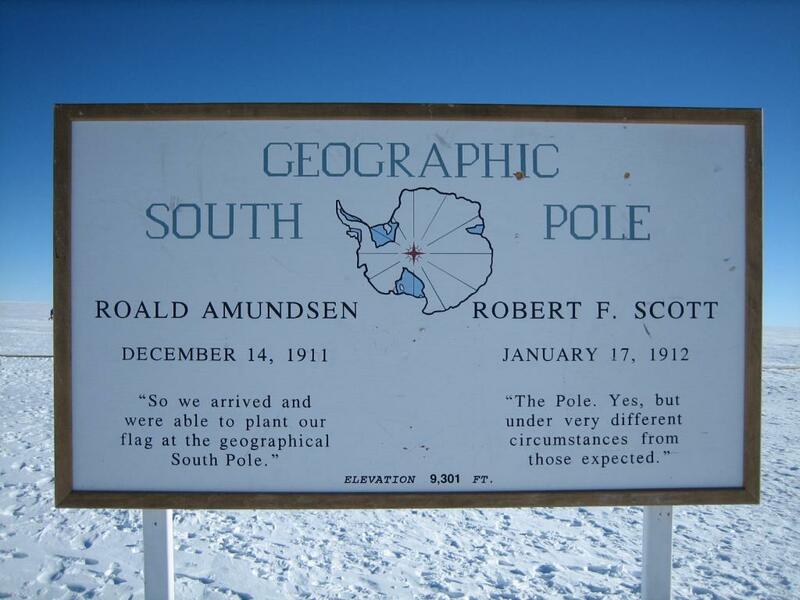 The sign records the respective dates that Roald Amundsen and Robert F. Scott reached the Pole, followed by a short quotation from each man, and gives the elevation as "9,301 FT.". A new marker stake is designed and fabricated each year by staff at the site. The Ceremonial South Pole is an area set aside for photo opportunities at the South Pole Station. It is located some meters from the Geographic South Pole, and consists of a metallic sphere on a short bamboo pole, surrounded by the flags of the original Antarctic Treaty signatory states. Argentinian soldiers saluting the flag after erecting the pole in 1965. Amundsen's Tent: The tent was erected by the Norwegian expedition led by Roald Amundsen on its arrival on 14 December 1911. It is currently buried beneath the snow and ice in the vicinity of the Pole. It has been designated a Historic Site or Monument (HSM 80), following a proposal by Norway to the Antarctic Treaty Consultative Meeting. The precise location of the tent is unknown, but based on calculations of the rate of movement of the ice and the accumulation of snow, it is believed, as of 2010, to lie between 1.8 and 2.5 km (1.1 and 1.5 miles) from the Pole at a depth of 17 m (56 ft) below the present surface. Argentine Flagpole: A flagpole erected at the South Geographical Pole in December 1965 by the First Argentine Overland Polar Expedition has been designated a Historic Site or Monument (HSM 1) following a proposal by Argentina to the Antarctic Treaty Consultative Meeting. In 1820, several expeditions claimed to have been the first to have sighted Antarctica, with the very first[clarification needed] being the Russian expedition led by Fabian Gottlieb von Bellingshausen and Mikhail Lazarev. The first landing was probably just over a year later when American Captain John Davis, a sealer, set foot on the ice. Amundsen's party at the South Pole, December 1911. From left to right: Amundsen, Hanssen, Hassel and Wisting (photo by fifth member Bjaaland). British explorer Robert Falcon Scott on the Discovery Expedition of 1901–04 was the first to attempt to find a route from the Antarctic coastline to the South Pole. Scott, accompanied by Ernest Shackleton and Edward Wilson, set out with the aim of travelling as far south as possible, and on 31 December 1902, reached 82°16′ S. Shackleton later returned to Antarctica as leader of the British Antarctic Expedition (Nimrod Expedition) in a bid to reach the Pole. On 9 January 1909, with three companions, he reached 88°23' S – 112 miles (180 km) from the Pole – before being forced to turn back. The first men to reach the Geographic South Pole were the Norwegian Roald Amundsen and his party on December 14, 1911. Amundsen named his camp Polheim and the entire plateau surrounding the Pole King Haakon VII Vidde in honour of King Haakon VII of Norway. Robert Falcon Scott returned to Antarctica with his second expedition, the Terra Nova Expedition, initially unaware of Amundsen's secretive expedition. Scott and four other men reached the South Pole on January 17, 1912, thirty-four days after Amundsen. On the return trip, Scott and his four companions all died of starvation and extreme cold. In 1914 Ernest Shackleton's Imperial Trans-Antarctic Expedition set out with the goal of crossing Antarctica via the South Pole, but his ship, the Endurance, was frozen in pack ice and sank 11 months later. The overland journey was never made. US Admiral Richard Evelyn Byrd, with the assistance of his first pilot Bernt Balchen, became the first person to fly over the South Pole on November 29, 1929. Amundsen–Scott South Pole Station. The ceremonial pole and flags can be seen in the background, slightly to the left of centre, below the tracks behind the buildings. The actual geographic pole is a few more metres to the left. The buildings are raised on stilts to prevent snow build up. It was not until 31 October 1956 that humans once again set foot at the South Pole, when a party led by Admiral George J. Dufek of the US Navy landed there in an R4D-5L Skytrain (C-47 Skytrain) aircraft. The US Amundsen–Scott South Pole Station was established by air over 1956–1957 for the International Geophysical Year and has been continuously staffed since then by research and support personnel. After Amundsen and Scott, the next people to reach the South Pole overland (albeit with some air support) were Edmund Hillary (January 4, 1958) and Vivian Fuchs (January 19, 1958) and their respective parties, during the Commonwealth Trans-Antarctic Expedition. There have been many subsequent expeditions to arrive at the South Pole by surface transportation, including those by Havola, Crary and Fiennes. The first group of women to reach the pole were Pam Young, Jean Pearson, Lois Jones, Eileen McSaveney, Kay Lindsay and Terry Tickhill in 1969. In 1978-79 Michele Eileen Raney became the first woman to winter at the South Pole. 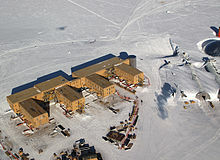 Subsequent to the establishment, in 1987, of the logistic support base at Patriot Hills Base Camp, the South Pole became more accessible to non-government expeditions. On December 30, 1989, Arved Fuchs and Reinhold Messner were the first to traverse Antarctica via the South Pole without animal or motorized help, using only skis and the help of wind. Two women, Victoria E. Murden and Shirley Metz reached the pole by land on January 17, 1989. The fastest unsupported journey to the Geographic South Pole from the ocean is 24 days and one hour from Hercules Inlet and was set in 2011 by Norwegian adventurer Christian Eide, who beat the previous solo record set in 2009 by American Todd Carmichael of 39 days and seven hours, and the previous group record also set in 2009 of 33 days and 23 hours. The fastest solo (female), unsupported and unassisted trek to the south pole was performed by Hannah McKeand from the UK in 2006. She made the journey in 39 days 9hrs 33mins. She started on the 19th November 2006 and finished on the 28 December 2006. In the 2011/12 summer, separate expeditions by Norwegian Aleksander Gamme and Australians James Castrission and Justin Jones jointly claimed the first unsupported trek without dogs or kites from the Antarctic coast to the South Pole and back. The two expeditions started from Hercules Inlet a day apart, with Gamme starting first, but completing according to plan the last few kilometres together. As Gamme traveled alone he thus simultaneously became the first to complete the task solo. On 28 December 2018, the first Briton unassisted journey to the south pole was performed by Captain Lou Rudd who became the second person to make the journey in 56 days. During the southern winter (March–September), the South Pole receives no sunlight at all, and from May 11 to August 1, between extended periods of twilight, it is completely dark (apart from moonlight). In the summer (September–March), the sun is continuously above the horizon and appears to move in a counter-clockwise circle. However, it is always low in the sky, reaching a maximum of 23.5° in December. Much of the sunlight that does reach the surface is reflected by the white snow. This lack of warmth from the sun, combined with the high altitude (about 2,800 metres (9,200 ft)), means that the South Pole has one of the coldest climates on Earth (though it is not quite the coldest; that record goes to the region in the vicinity of the Vostok Station, also in Antarctica, which lies at a higher elevation). Temperatures at the South Pole are much lower than at the North Pole, primarily because the South Pole is located at altitude in the middle of a continental land mass, while the North Pole is at sea level in the middle of an ocean, which acts as a reservoir of heat. The South Pole is at an altitude of 9,300 feet (2,800 m) but feels like 11,000 feet (3,400 m).. Centrifugal force from the spin of the planet pulls the atmosphere toward the equator. The South Pole is colder than the North Pole primarly because of the elevation difference and for being in the middle of a continent. The North Pole is a few feet from sea level in the middle of an ocean. In midsummer, as the sun reaches its maximum elevation of about 23.5 degrees, high temperatures at the South Pole in January average at −25.9 °C (−15 °F). As the six-month "day" wears on and the sun gets lower, temperatures drop as well: they reach −45 °C (−49 °F) around sunset (late March) and sunrise (late September). In midwinter, the average temperature remains steady at around −60 °C (−76 °F). The highest temperature ever recorded at the Amundsen–Scott South Pole Station was −12.3 °C (9.9 °F) on Christmas Day, 2011, and the lowest was −82.8 °C (−117.0 °F) on June 23, 1982 (for comparison, the lowest temperature directly recorded anywhere on earth was −89.2 °C (−128.6 °F) at Vostok Station on July 21, 1983, though −93.2 °C (−135.8 °F) was measured indirectly by satellite in East Antarctica between Dome A and Dome F in August 2010). Mean annual temperature at the South Pole is –49.5 °C (–57.1 °F). The South Pole has an ice cap climate (Köppen climate classification EF). It resembles a desert, receiving very little precipitation. Air humidity is near zero. However, high winds can cause the blowing of snowfall, and the accumulation of snow amounts to about 7 cm (2.8 in) per year. The former dome seen in pictures of the Amundsen–Scott station is partially buried due to snow storms, and the entrance to the dome had to be regularly bulldozed to uncover it. More recent buildings are raised on stilts so that the snow does not build up against their sides. In most places on Earth, local time is determined by longitude, such that the time of day is more-or-less synchronised to the position of the sun in the sky (for example, at midday the sun is roughly at its highest). This line of reasoning fails at the South Pole, where the sun rises and sets only once per year, and all lines of longitude, and hence all time zones, converge. 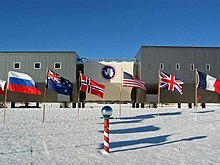 There is no a priori reason for placing the South Pole in any particular time zone, but as a matter of practical convenience the Amundsen–Scott South Pole Station keeps New Zealand Time (UTC+12/UTC+13). This is because the US flies its resupply missions ("Operation Deep Freeze") out of McMurdo Station, which is supplied from Christchurch, New Zealand. Due to its exceptionally harsh climate, there are no native resident plants or animals at the South Pole. Remarkably, though, off-course south polar skuas and snow petrels are occasionally seen there. In 2000 it was reported that microbes had been detected living in the South Pole ice. ^ "Where is the real Pole really?". Retrieved 2008-03-25. ^ a b "Marker makes annual move", page 6, Antarctic Sun. January 8, 2006; McMurdo Station, Antarctica. ^ "Sign at the (ever moving) actual geographical South Pole (a few feet away from the Ceremonial Pole)". Pierre R. Schwob Physics/Astronomy. Retrieved 2013-05-25. ^ Kiefer, Alex (January 1994). "South Pole Marker". Retrieved 2008-03-24. ^ "List of Historic Sites and Monuments approved by the ATCM (2012)" (PDF). Antarctic Treaty Secretariat. 2012. Retrieved 2014-01-07. ^ "List of Historic Sites and Monuments approved by the ATCM (2012)" (PDF). Antarctic Treaty Secretariat. 2012. Retrieved 2013-10-04. ^ Armstrong, Terence (1971). "Bellingshausen and the discovery of Antarctica". Polar Record. 15 (99): 887–889. doi:10.1017/S0032247400062112. ^ Hurtigruten. "General Information". hurtigruten.com/us/. Hurtigruten. Archived from the original on 2014-10-23. Retrieved 2014-10-23. ^ Van Doren, Charles Lincoln; McHenry, Robert (1971). Webster's Guide to American History: A Chronological, Geographical, and Biographical Survey and Compendium. Merriam-Webster. p. 1326. ISBN 978-0-87779-081-5. ^ Berkman, Paul Arthur (2002). Science Into Policy: Global Lessons from Antarctica. Academic Press. p. 35. ISBN 978-0-12-091560-6. ^ Berkman, Paul Arthur (2002). Science Into Policy: Global Lessons from Antarctica. Academic Press. p. 37. ISBN 978-0-12-091560-6. ^ Simpson-Housley, Paul (2002). Antarctica: Exploration, Perception and Metaphor. Taylor & Francis. p. 24. ISBN 978-0-203-03602-0. ^ "First Women at Pole". South Pole Station. Retrieved 24 August 2016. ^ "Famous Firsts". The Antarctic Sun. United States Antarctic Program. 13 November 2009. Retrieved 25 August 2016. ^ "Südtirol – Diese Seite existiert nicht". Suedtirol.info. Archived from the original on March 10, 2012. Retrieved 2012-08-13. ^ "Antarctic Firsts". Antarctic Circle. 4 October 2014. Retrieved 24 August 2016. ^ Explorersweb (2011-01-13). "Breaking news: Christian Eide bags the South Pole solo speed ski world record". explorersweb.com. Retrieved 2011-01-13. ^ "Canadians break speed record trekking to South Pole". Toronto Star. The Canadian Press. 2009-01-07. Retrieved 2010-02-10. ^ Glenday, Craig (2013). Guinness World Records 2014. The Jim Patison Group. p. 76. ISBN 978-1-908843-15-9. ^ "Ice Trek Expeditions". Retrieved 2013-05-25. ^ "Crossing the Ice". Retrieved 2013-05-25. ^ "Wilson, nå er vi framme!". Archived from the original on 2013-06-24. Retrieved 2013-05-25. ^ "Capt Lou Rudd is first Briton to cross Antarctic unaided". BBC News. 29 December 2018. ^ Science question of the week, Goddard Space Flight Center. ^ "The USAP Portal: Science and Support in Antarctica - Course Material". www.usap.gov. ^ "Why is the South Pole colder than the North Pole?". ^ Matthew A. Lazzara (2011-12-28). "Preliminary Report: Record Temperatures at South Pole (and nearby AWS sites…)". Retrieved 2011-12-28. ^ "How cold is the Antarctic?". NIWA. 2007-02-27. Retrieved 2012-08-13. ^ "Antarctic Weather". Retrieved 2013-05-25. ^ "Weather and Climate-The Climate of Amundsen–Scott" (in Russian). Weather and Climate (Погода и климат). Retrieved 5 April 2017. ^ "Klimatafel von Amundsen - Scott / Südpol-Station (USA) / Antarktis" (PDF). Baseline climate means (1961-1990) from stations all over the world (in German). Deutscher Wetterdienst. Retrieved 5 April 2017. ^ "Amundsen–Scott Climate Normals 1961−1990". National Oceanic and Atmospheric Administration. Retrieved 5 April 2017. ^ Mark Sabbatini, "Non-human life form seen at Pole", The Antarctic Sun, 5 January 2003. Wikimedia Commons has media related to South Pole. Wikivoyage has a travel guide for South Pole. Listen to Ernest Shackleton describing his 1908 South Pole Expedition, and read more about the recording on [australianscreen online].